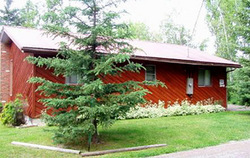 Close to Glacier National Park and Big Mountain, Carver's Cabin is located in the quaint ski town of Whitefish. The private lake access is about 2 blocks from the cabin and has a dock for swimming. Boats can use beach during the day and there is a very good restaurant within walking distance. Directions: Carver's Cabin is about 2.5 miles from downtown Whitefish and on the road to Big Mountain. Go north on Wisconsin Avenue and take 'Sandbagger' lane to left, house at the end of the street.